Being a massive Alice and Narnia nut I’m a sucker for any book that takes me through a crack in our world and into another, much stranger place. It’s the ultimate fantasy device, playing directly into children’s imaginative games. Revisiting these stories later in life is a direct reminder of what it felt like to slip between that gap in the fence and into a world that was free of adults, a little bit dangerous, but altogether ours. Picking up Fattypuffs and Thinifers for the first time recently I was once again transported back through the wardrobes of my mind. 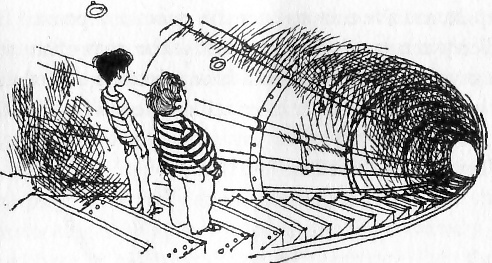 The story begins with two bickering brothers, one fat, one thin, falling into a subterranean cave deep below the forest in which they’d been playing with their father. 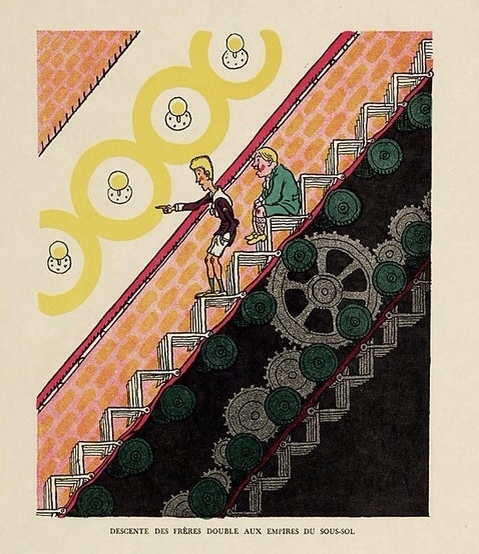 Landing, Alice like without injury, they then take an escalator lit by Art-Deco up-lighters down to the world of the warring Fattypuffs and Thinifers. 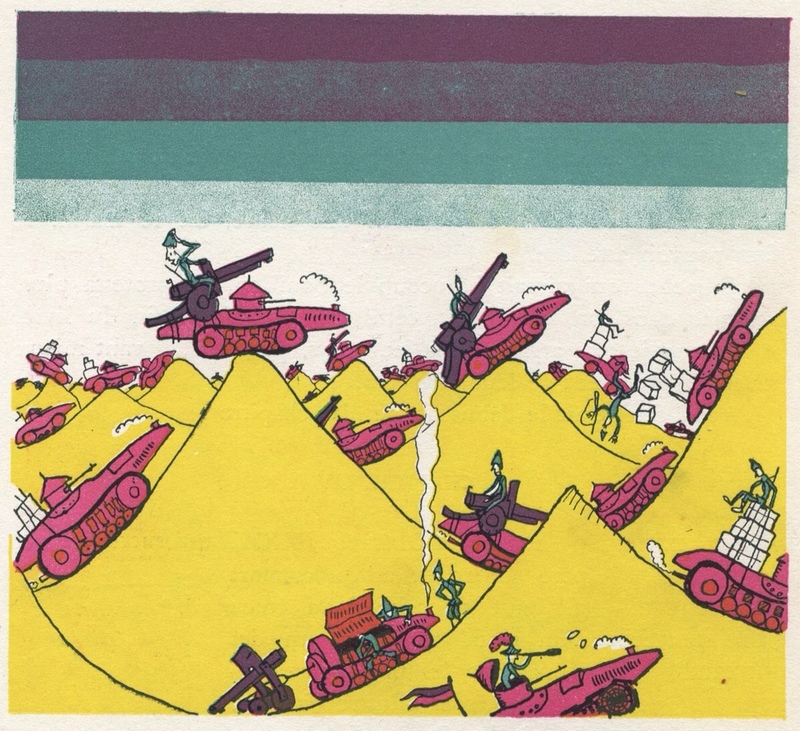 The hostility of these two nations is described by the illustrator of the 1968 edition Fritz Wegner as being ‘due to conflicting lifestyles.’ Their distaste for one another leads to a strict immigration policy that admits only people above or below a certain weight. So the boys are forced apart. Skinny Edmund sets off to stay with the Thinifers and fatty Maurice sails away in comfort to the land of the Fattypuffs. Written in 1930 by French author Andre Maurois, the story that follows acts as a reminder of the horrors of the great war, but is also a warning against the war yet to come – a war that is the direct result of a state ruled by an illogical ideology. The welcoming, food obsessed Fattypuffs are presumably meant to represent the French while the Thinifers are fascistic fitness fanatics, playing on German stereotypes. But there is also a good deal of British influence here. Maurois spent a good deal of time in England – acting as a liaison officer for the British army in WW1, and going on to write biographies and a collection of essays about British life called The Silence of Colonel Bramble. 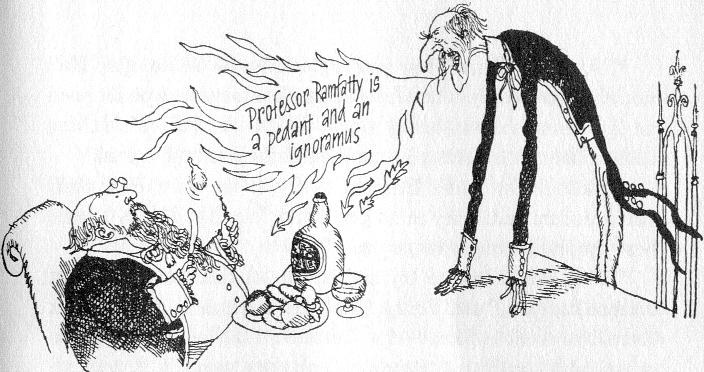 Lewis Carroll is an influence, but perhaps a closer comparison can be found in Swift’s Gulliver’s Travels. 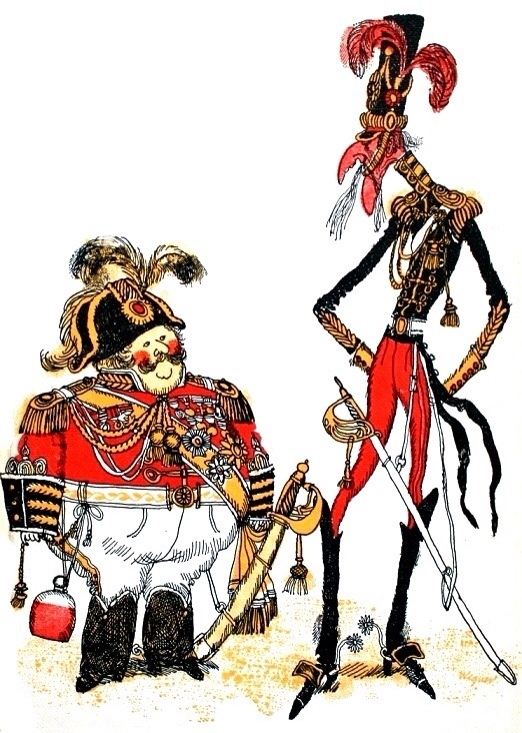 There’s a similar satirical intent in the story of warring nations and Maurois also plays similar games with scale, delighting in the details of these imaginary countries that are entirely defined by their size. There are many delicious opportunities for illustrators here. The Fattypuffs are a particular gift, with their voluptuous buildings, animals and even trains. 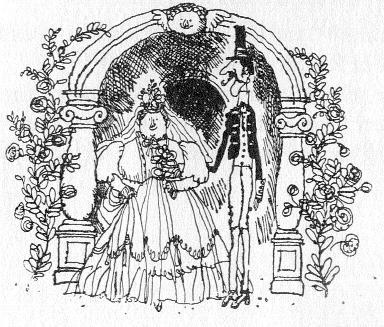 The first person to illustrate the book – Patapoufs et Filifers, as it was originally titled – was Jean Bruller. His bright colour lithographs are totally of their time, and root the book much more in that classic period of design and illustration that also produced Babar. Like Jean de Brunhoff’s work he was also writing against the backdrop of French colonialism. The previous year he’d illustrated a children’s book called Loulou Chez Les Negres (Loulu among the Negroes), a story that pitted intrepid young French boys against fearsome black savages. That the same artist then produced Patapoufs, a book that is so modern and pacifist in its intent comes as something of a surprise. But during the interwar years the world was changing at an alarming rate, and perhaps Bruller was running to keep up with changing attitudes to colonialism. By the time the Second World War came his politics were firmly fixed, and he became a member of the Resistance, setting up the underground publishing house Les Éditions de Minuit which still runs today. He wrote a wartime classic Le Silence de la mer (The Silence of the Sea), a book which became a symbol of the struggle against the Germans. 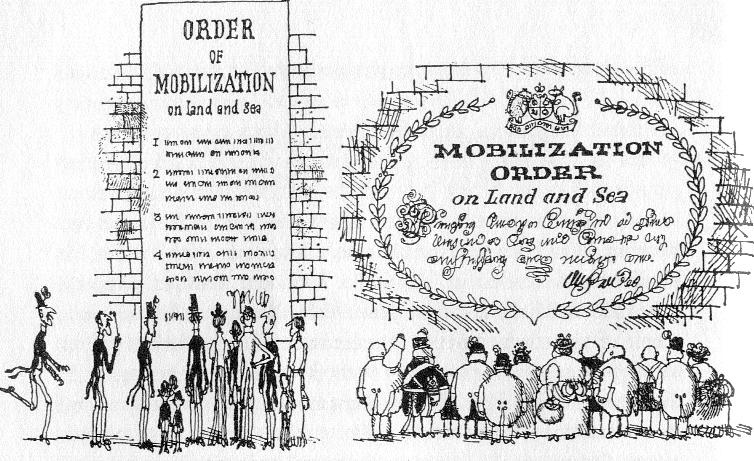 Bruller’s drawings are at their best when dealing with the details of the military machine. We see the differences between trench design, an idea the Fattypuffs adopt from Maurice’s tales of the Great War. However the Fattypuffs are unable to fit into standard narrow trenches, so they devise ‘a sort of globular trench, narrow at the top and rounded at the sides’ to house their waists, but protect their necks. Unfortunately there’s a fatal design flaw: ‘It can only be entered at either end, so that it is not possible to make a mass sortie.’ Unable to leave the trenches their forces are stuck fast as the wily Thinfers attack elsewhere. 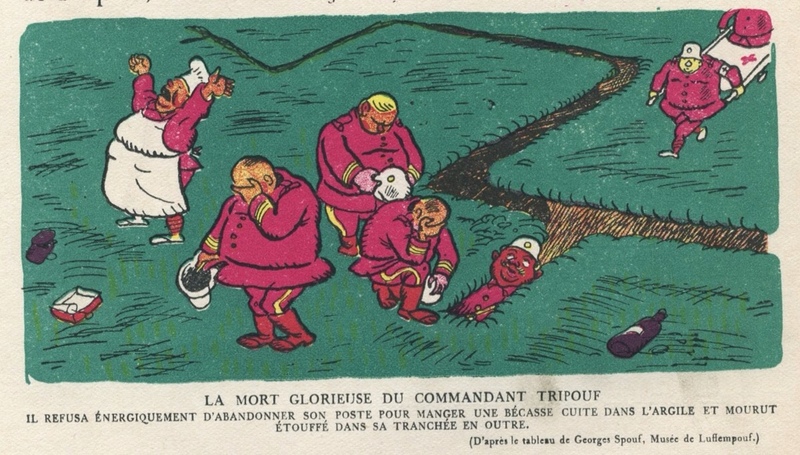 The consequences for one of the brave soldiers, Commandant Tripouf is captured with black humour by Bruller, his head trapped and purple with asphyxiation between the narrow sides of the trench. If anything the book is even more startling in its final act, which sees the Thinifers victorious, but also maps out a future where the Fattypuff culture begins to seep into the world of the Thinifers. The United Kingdoms that emerge could be read as an anticipation of the Europan union. Though to do that might be overdoing the historical context. Instead just enjoy it as a fabulist piece of science fantasy, happily soon to be available to a new generation with illustrations by Kristyna Litten. 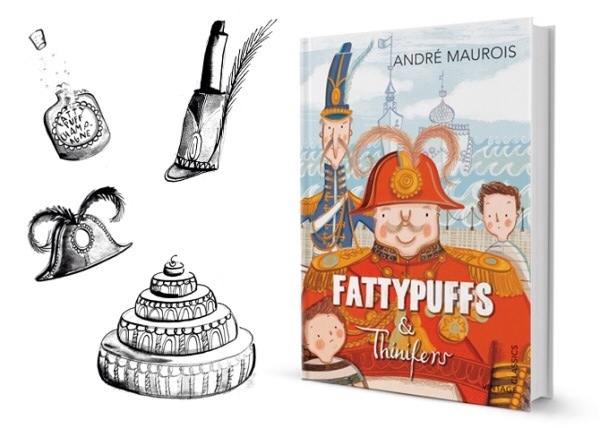 Fattypuffs and Thinifers still has a valuable message for young readers: Make cakes, not war. Tags: Alice in Wonderland, Andre Maurois, Babar, Fattypuffs and Thinifers, Fritz Wegner, Jean Bruller, Kristyna Litten, Lewis Carroll, Narnia, Patapoufs et Filifers. Bookmark the permalink.